Vintage Haskell jewelry is highly sought after, causing collectors to hunt for it in every imaginable venue. The prices keep spiraling up and claims that this is a Miriam Haskell abound. Is it a Miriam Haskell? Haskell jewelry is displayed in numerous vintage costume jewelry books, but the jewelry is never discussed in sufficient detail to answer that question. This is the only book that gives collectors enough key information to make intelligent buying decisions. This important work provides specific details on the art, design, style, materials, construction, and signatures, all vital to the identification and dating of Haskell pieces. It also dispels many of the myths that allow “wanna-bes” and fakes to flourish. This book contains approximately 600 fascinating photographs of Haskell jewelry, the most extensive collection ever provided in one body of work. They are categorized by designer, specifying notable eras, with notations on innovations and style preferences and in-depth descriptions pointing to key Haskell identifiers. 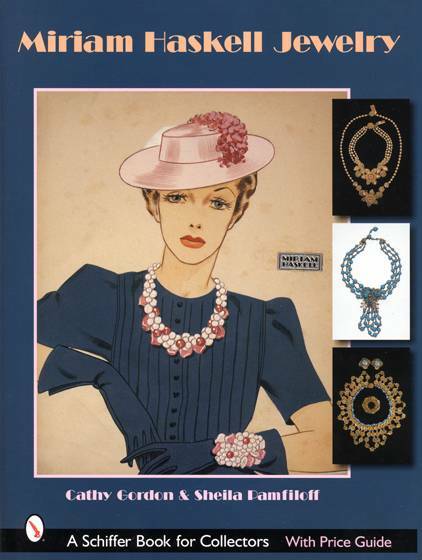 Readers at many levels, from casual admirers to serious collectors and dealers, will find this book informative, and the illustrated jewelry breathtaking. The book is available at Amazon.com, Schiffer Publications, and various retail sources. I came home from work this evening and found an amazing treat. The Jewels of Miriam Haskell by our own Cathy Gordon and her partner in brilliance, Sheila Pamfiloff. I can't even begin to describe how perfect this book is. Cover to cover, it is as beautiful as a Haskell jewel. As you might expect, given the authors, the organization is superb, the research is impeccable, and the photography is to die for. If you haven't ordered this book yet, do it quick!!! If you don't want to buy it for yourself, tell every person who loves you that it's all you want for (fill in your holiday of choice here). And if you really want to win friends and influence people, give it as a gift. Even non-jewelry collectors will drool. Hi, Cathy! The book arrived..... 1) It's terrific! Love the info and the pix. Can't wait to read it ALL. The watercolors just knock me out and the story accompanying them is amazing. You must have been going nuts when you heard this. Natch I love the jewelry pix, but you guys did a swell job on the research side as well. Great job, Cath, and please tell Sheila the same. I was so excited and pleased to receive your Haskell book. Of course, I just did a quick look at the fab pictures, and am trying to get my tasks done today so I can sneak a better look. And after I get some time, I can't wait to actually read the text. ........ the photography is stupendous. And the pieces are just so wonderful that I feel like increasing our mortgage so I could find and spend thousands on similar pieces. This book will be by my bedstand. Maybe now I will go to bed at a reasonable time because I know I want a half hour of reading this each night. ...... You must be very proud, and you deserve that feeling of pride. I know how much work goes into writing a book...... Anyway, I so admire what you two did. or fake Haskell set being sold on ebay and refrained from bidding. Hi Sheila. The book is fabulous........ I have thoroughly enjoyed it and am about to die to think that a few of the pieces I have owned at one time never realizing that they were Haskell. My collection is modest but I love every piece. I got my copy, too. HATS OFF to Cathy and Sheila - it's a terrific book, There's only one problem, and that's trying to remember where I left my bib before opening it again....wouldn't want to ruin the pages with all that drool! This is the most beautiful book. I only wish Miriam was here to see it. Congratulations to you both. My husband won't put it down. He said it's great. You two are the best. Of course, now that I've read your book, I regret almost all the nice pieces of Haskell I sold. I have to keep reminding myself that I am a dealer, not a collector. I found a few things I had sold. A few I had passed up. And a very few minor ones that I still have. Barbara ..... is a friend of mine, met you at one of the workshops ...... and says your book is out... how did I miss it?! I would like to order one if I may......... Barb just got hers and is raving about how fabulous it is! What a beautiful book. You both have surpassed yourselves. The illustrations are absoulutely beautiful. I just scanned through, but it will take me a few days to read and absorb it all. Again Thanks a million. Will talk to you soon. Got your book today...It look terrific! I'll get to read it thoroughly tomorrow when we head down state .........! The book came today. It certainly is beautiful; and gives me something to look for. You guys did a great job! Welcome to the ....., Shelia!!!!! Also much congratulations on the Miriam Haskell book. Sheila, welcome to Jewelry .....! great job! I see you are the photographer. Lot of talent there too. I just wanted you all to know that my incredible book arrived today. This is a MUST HAVE for all our collections. The photography is outstanding. I cannot wait to read and absorb all of the wonderful information and pictures!! Congratulations to you both. It's OUTSTANDING!!! Book arrived in today's mail......FABULOUS!!! I've been through your book 3 times now. It is wonderful. I plan to take it along next time I visit my sister. ........ it might take her mind off things to spend time looking through the your book. Got your book, it is absolutely terrific. ......... I think you have set a new standard for jewelry collectibles books. Not just pictures, but a methodology for recognizing fabrication techniques. Most excellent! other beautiful Haskell I feel I must have it all. However, the hunt for GREAT HASKELL will be even harder once everyone gets your book. THE GLITTER BOX is Proud to Offer a Fine Selection of Vintage Designer Costume Jewelry; Vintage Scandinavian, Arts & Crafts, and Studio Artist Sterling Silver Jewelry; and Vintage Taxco & Mexican Sterling Silver Jewelry and Holloware. Your Enjoyment and Appreciation of Your Selections is of Utmost Importance to me and I Greatly Value your Business. Thanks for Shopping THE GLITTER BOX!